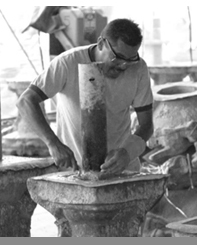 Al's Garden Art products are manufactured by Fiore Stone, Inc., an American manufacturer. 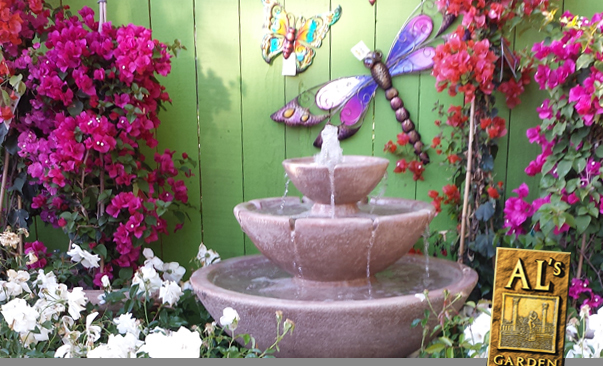 We invite you to visit our displays and see and hear a large selection of our most popular Al's Garden Art products. Fiore Stone warehouses all cast-stone products in plain concrete at its factory in Southern California and finishes each item by hand custom to our order. We are proud to receive shipment from Fiore Stone several times in season and we welecome the opportunity to assist you, or your clients with your specific interests. Al's Garden Art Fountains and Statuary are made of natural materials and color appearance may vary by degree of texture, size, shape of area and lighting. The finishing process follows basic antiquing principals. An antique is applied over a base color or natural concrete and hand rubbed. This creates an aged highlight around the intricate detail in each design.